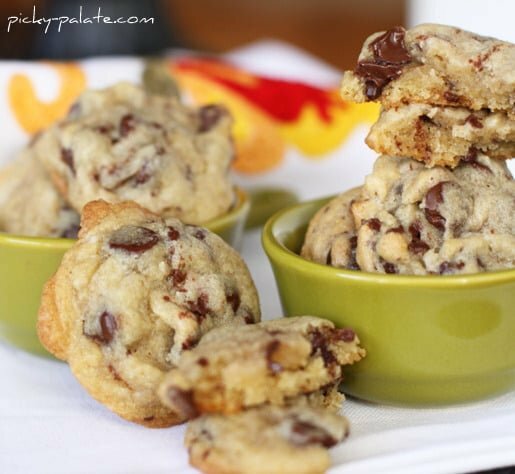 Almond Lover's Chocolate Chip Cookies. Oh my goodness. These are SO, SO good. You all know how much I love marzipan. Well these have almond paste--which is essentially marzipan--in them. I found the recipe at Picky Palate. I can assure you I'll be making these again. I like paper chains. In October, the kids and I made a paper chain that had almost 100 links to represent the number of days Bruce has left on his mission. At the time we put the chain in our dining room. It went from one wall, to the back wall, then looped over the light fixture and ended up on the other wall. Today there are eleven links and it's hanging on the door in our family room. Doesn't that just make you smile? It makes me smile! This was one of my most recent reviews. Thanks Colleen. 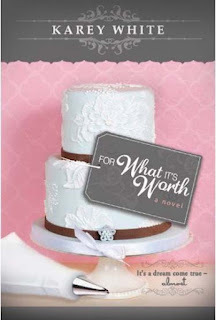 Colleen's Thoughts: Such a lovely book in so many ways! Karey White's ability to describe the cakes, hotels, rooms, or shops, and the beautiful Seattle landscape is exceptionally vivid. I wished there had been a picture to go along with each of the cakes Abby made. Each recipe at the beginning of the chapters made me want to rush into the kitchen and try it out. Delicious! As in so many romances, both fictional and real, Abby and Dane's relationship is fraught with a heart wrenching lack of communication. The good news is, I finished the book feeling enriched by the exquisite beauty of not only the descriptive language, but the beauty of the male/female relationship. The character development is poignant - a gentle reminder that each of us needs to take a hard look at our own lives and realign ourselves with what is most important. This is Peach Propel. I really like Propel and I really like peaches, so this is a natural fit. I enjoy treating myself to one of these after grocery shopping. It's my reward. If you're thirsty, you should give it a try. This is Eddie Redmayne. He plays Marius in the new movie, Les Miserables. If you've seen it, you'll remember this emotional and beautiful rendition. If you haven't, maybe this will help you want to see it. I LOVED him as Marius. When he sings this song, it's one of the two or three most emotional points in the movie for me. I cried during this song both times I've seen it. I've never loved Marius before--in any of the versions of the play or anniversary concerts I've seen. That changed with the movie though. I loved Eddie Redmayne's portrayal, I loved his voice, and I was blown away by his emotion. It literally took my breath away. Labels: Am I OCD?, Being a Mom, Food, Missions, Movies, Music, My Book, Random Ramblings, Ugh! I love those journals and I loved Eddie Redmayne, especially Empty Chairs. Sigh. Wonderful. Actually, Missy, that's what I used. I should have specified that. I don't really care for the Odense Almond Paste. It's always super hard, but the canned is always soft and delicious. I doubled the recipe and then used an 8 oz can of almond paste. My girls and I just enjoyed a little spoon of it before using it so I figured it was about 6 oz after our tastes. I love all of these things as well. I wish I was eating one of those cookies right now.